Mobile phones come in all shapes and sizes these days. Looking at how the global smartphone market has responded in recent years, most smartphone manufacturing companies are frantically increasing their R&D and marketing spends in order to woo the customer. Design and innovation are suddenly the new buzzwords. Every company wants to gain market edge but the big question is: do they really feel the customer's pulse? Taiwanese company, ASUS, seems to at least understand what the Indian users want and continue to impress year after year with its best in class smartphones. I truly applaud their attention to details. 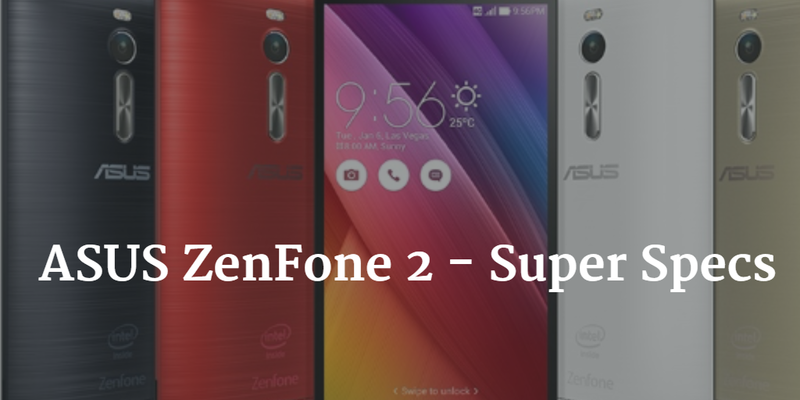 In this blog post, I'm going to share why you should wait for the new ASUS ZenFone 2 and what can you expect in terms of specs. They say first impression is the last impression. And rightly so. ZenFone 2 adorns a premium look and feel, owing to its 3.9 mm ultra-thin edges and concentric circle pitch of 0.13 mm. The phone is incredibly slim and extremely comfortable to hold, making ASUS score high - both in design as well as ergonomics. ZenFone 2 has a 5.5-inch display but you could easily mistake it as 5-inch. This engineering feat is achieved by restricting the bezel width to bare minimum, which also led to a spectacular 72 percent screen-to-body ratio. Unarguably the first smartphone in the world that offers 4GB RAM. Now run several apps simultaneously and switch between them without any hassle. The dual-channel DDR3 RAM packs a punch to your new ZenFone 2, making multitasking a child's play. Also, lag or stuttering is a thing of the past now. Its performance is further bolstered by a 64-bit Intel Atom 2.3GHz processor. That's not all; the ZenFone 2 is designed for handling download speeds up to 250Mbps and touch responsiveness of 60ms. ASUS is known to leverage its PixelMaster technology for capturing high-resolution images with zero shutter lag. The phone comprises a 13 MP Rear Camera, 5 P Lagan Lenses, ƒ/2.0 Aperture, Toshiba Sensor, Blue Glass Filter, and Dual LED Real Tone Flash. In Low Light mode, no other phone captures up to 400% brighter photos at night. This is also true for places where light is dim. Imagine not having to use the flash at all. All credit to Pixel-merging technology that ZenFone 2 employs. ZenFone 2 offers better viewing angles than its predecessors. Even at acute angles, it will be easy for two people to watch videos without any loss of colors. For ASUS, the battery life remained its Achilles' heel. However, with ZenFone 2, you'll see a surge in the battery capacity from 2,110mAh to 3,000mAh. ASUS will surprise you with its updated Zen UI based on the Android 5.0 (or Lollipop). This is also the company's first attempt at building a custom Android based UI. ZenFone 2 has 27 ASUS and third-party apps, alongside Google apps, which is freaking exciting to say the least. In the business of creating classic videos? Now record up to 1080p full HD videos using ZenFone 2, via the rear camera's Video mode. Won't it be awesome if your phone could recharge to 60 percent of its capacity in flat 39 minutes? Thanks to the BoostMaster technology from ASUS, your ZenFone 2 is equipped to perform fast charging. Finally, ZenFone 2 is a fantastic smartphone with power-packed performance. You'll never encounter an instance where the phone exhibits slowness while multitasking. You might have to pay a little over INR 20k to purchase the ZenFone 2 but you will not regret your decision to not buy Huawei Honor 6 Plus, Moto X (Gen 2), or Oppo Find 7. A mid-range smartphone like the ZenFone 2 offers better performance than most flagship products in the market today. Go grab the future-ready smartphone for you and your family.